Marcus Rashford has claimed a top-four finish looked a lost cause for Manchester United under Jose Mourinho as he hailed the turnaround under caretaker manager Ole Gunnar Solskjaer. United's progress under Solskjaer suffered a setback when they lost 2-1 to Wolverhampton Wanderers in the FA Cup quarter-finals in a performance the Norwegian described as the worst of his four-month reign. It followed a 2-0 defeat by Arsenal in the Premier League - their first in the top flight under Solskjaer - but United remain firmly in the hunt for Champions League qualification, trailing fourth-placed Arsenal by two points and Tottenham, in third, by three points. United were 11 points adrift of fourth and 13 points off third when Mourinho was sacked in December and Rashford says it was "impossible" to believe then that they could finish in the top four. 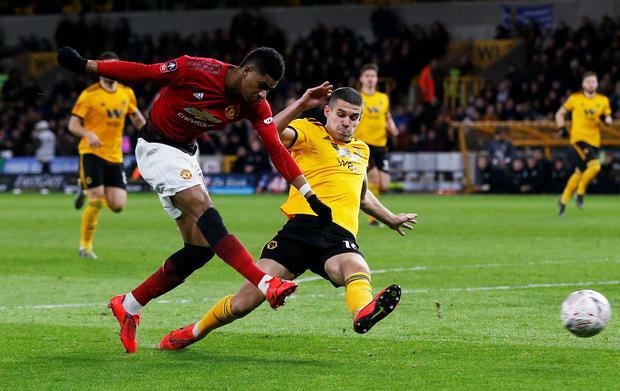 "We're in a place now, in the league, that was pretty much impossible two months ago," said Rashford, whose side face Watford at Old Trafford after the international break. "So we're just looking to carry it on now, to try and better ourselves. "I think just his (Solskjaer's) presence around the building has changed everyone really. Even the lady at the front desk, Kath, she's been working there for years, and you notice a difference in everyone. "Growing up at United, that's what the feeling has always been like - like this - and to have it back, the way it is now, is amazing. That's without even touching on what we've done on the pitch - how we've improved ourselves as a team, because that's where we can still improve a lot." Solskjaer faces a big challenge to rediscover momentum after back-to-back defeats. United looked disjointed against Wolves in a display more in keeping with Mourinho's final months in charge but Rashford believes Solskjaer has changed the mindset by introducing an attacking, front-foot approach. "He's come in and the first thing he was going on to us all about was about playing forward," Rashford told GQ magazine. "I'd say that's been the biggest change, and it's risky, but it's worth the risk if it pays off."